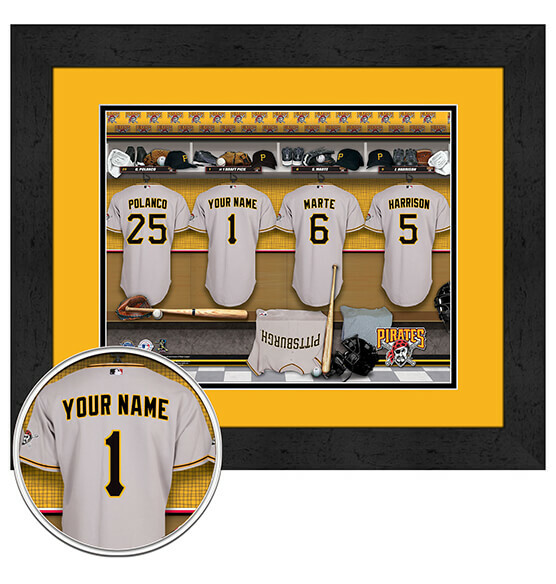 You may never be Roberto Clemente, but with our Pittsburgh Pirates Personalized Locker Room Framed Wall Art Décor, you can have your name added to the back of a Buccos’ jersey in this charming locker room scene. Our premium custom Pittsburgh Pirates sports décor makes a great gift to give to friends, family or co-workers — or simply a gift to yourself! With its sleek black frame, digital double mat and its full-color print, our high-quality artwork is guaranteed to be a piece that will be cherished. It features vibrant Pirates team colors, team logo and comes ready to hang thanks to a convenient sawtooth hanger.